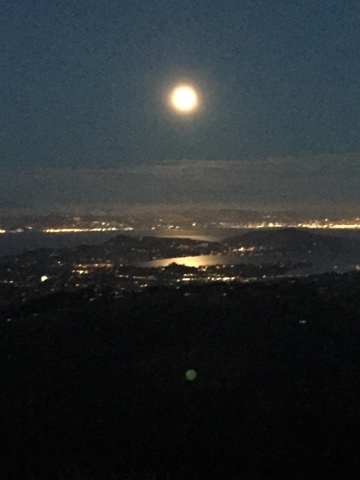 When I first moved out to California I heard someone talk about going on a full moon hike. That sounded incredible to me so I stored it under my "California Bucket List" and promptly forgot about it. When it came to finding plans for this weekend, Matt mentioned that he wanted to hike. He's been injured so we wanted to find something short, but cool. I happened to look outside that night and realized that it looked like it was almost a full moon. I checked online and there was a hike happening that Saturday night! It was a free and led by a member (and Mount Tam Ranger) of Friends of Mt Tam. The hike left a little after 7pm from the Pantoll Ranger Station on the mountain. There was about 25 people from ages four to 65 and the hike was supposedly around 2 mi long. We hiked from the Ranger station up to the Mountain Theater, stopping at several stops along the way to look at the beautiful watercolor of sunset during the golden hour. 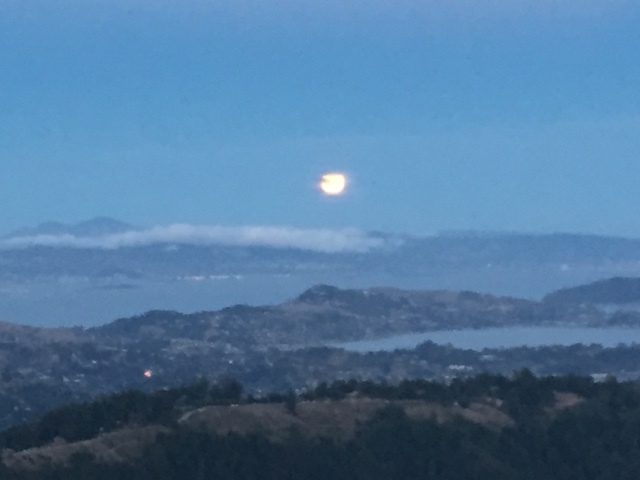 At one point we stopped and watched the big bright moon creep over the mountains. We heard shouts and cheers over the mountain as people watched the moon rise. It was incredible. 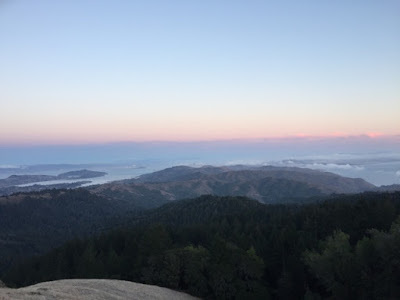 Our awesome guide, Rob Ross, told stories about the history of Mount Tam and some of the experiences he's seen in his 20+ years of hiking on the mountain. There were fabulous views the whole Bay area and I especially loved seeing the moonlight on the water (near Tiburon). Rob led us back and even had organic hot chocolate for us! It was a two and half hours that I will never forget. If you're looking for a free awesome experience in the area, the next hike will be on September 26. You can learn more here.